Unless the U.S. Congress acts, there is going to be a massive wave of tax increases in 2011. In fact, some are already calling 2011 the year of the tax increase. A whole host of tax cuts that Congress established between 2001 and 2003 are set to expire in January unless Congress chooses to renew them. But with Democrats firmly in control of both houses that appears to be extremely unlikely. These tax increases are going to affect every single American (at least those who actually pay taxes). But this will be just the first wave of tax increases. Another huge slate of tax increases passed in the health care reform law is scheduled to go into effect by 2019. So Americans that are already infuriated by our tax system are only going to become more frustrated in the years ahead. 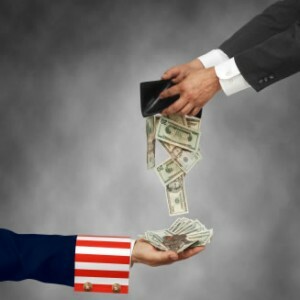 The reality is that the U.S. government will soon be digging much deeper into our wallets. The following are some of the tax increases that are scheduled to go into effect in 2011…. 1 – The lowest bracket for the personal income tax is going to increase from 10 percent to 15 percent. 2 – The next lowest bracket for the personal income tax is going to increase from 25 percent to 28 percent. 3 – The 28 percent tax bracket is going to increase to 31 percent. We have long claimed that any financial reform, determined by the Senator from Countrywide and the Rep from Fannie (thank you Cliff Asness), is worthless, and any debate over it is completely useless as it will achieve absolutely nothing. Sure, it fills blog pages and editorials but at the end of the day, the only thing that can save the financial system is, paradoxically, its destruction. There are just too many vested interests in the status quo, that absent a full blown implosion and subsequent reset of the system, it is all just smoke and mirrors. Luckily D-Day is approaching. We present an opinion by Robert Reich which validates our view that FinReg, and any debate thereof, is a joke. Robert Reich On Why The Finance Bill Won’t Do Anything. The most important thing to know about the 1,500 page financial reform bill passed by the Senate last week — now on he way to being reconciled with the House bill — is that it’s regulatory. If does nothing to change the structure of Wall Street. The bill omits two critical ideas for changing the structure of Wall Street’s biggest banks so they won’t cause more trouble in the future, and leaves a third idea in limbo. The White House doesn’t support any of them. First, although the Senate bill seeks to avoid the “too big to fail” problem by pushing failing banks into an “orderly” bankruptcy-type process, this regulatory approach isn’t enough. The Senate roundly rejected an amendment that would have broken up the biggest banks by imposing caps on the deposits they could hold and their capital assets. You do not have to be an algorithm-wielding Wall Street whizz-kid to understand that the best way to prevent a bank from becoming too big to fail is preventing it from becoming too big in the first place. The size of Wall Street’s five giants already equals a large percentage of America’s gross domestic product. This report was originally released as a six-part series. The first part was published on February 15, 2010. The last part was published on February 27, 2010. > Support this work by ordering the full report in book format. > Download full report with graphics and links. It’s time for 99% of Americans to mobilize and aggressively move on common sense political reforms. 3) Whether the foreign debt crisis are an omen for what’s coming to the US. Bill Fleckenstein is a writer for MSN Money, head of Fleckenstein Capital, and author of the acclaimed book GREENSPAN’S BUBBLES: THE AGE OF IGNORANCE AT THE FEDERAL RESERVE. Click here for a free trial to Wall St. Cheat Sheet. It’s begun folks! Congress is in chamber debating healthcare reform. 3:28: Stupak to hold press conference at 4:00 PM announcing his vote. The presumption is that it’s a "YES" but there’s nothing official on that. 3:31: For what it’s worth, here’s how we’d characterize the debate right now. 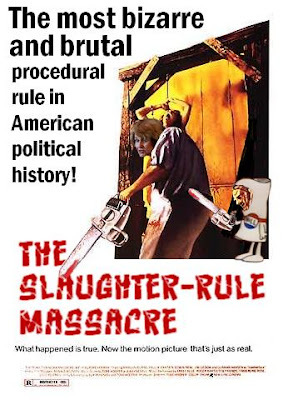 The Republicans have been trying to hammer The Democrats on various points: earmarks, rules, the deficit, etc. Democrats are ignoring the claims, and sticking to rhetoric, not engaging the critics. 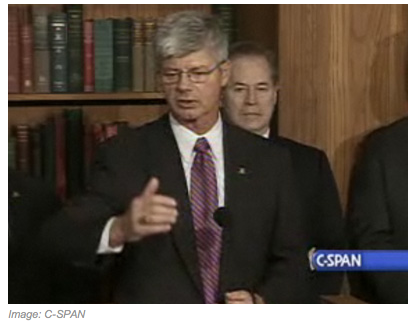 3:45: Evidently Stupak will announce that he’s a "YES." POLITICO explains what’s about to go down. March 18 (Bloomberg) — House Speaker Nancy Pelosi may be creating new grounds for a court challenge to the proposed U.S. health-care overhaul as she considers using a mechanism that would avoid a vote on the full legislation. Pelosi said this week she might use a parliamentary technique that would “deem” House members to have passed the Senate’s health-care plan by voting for a more politically palatable package of changes. 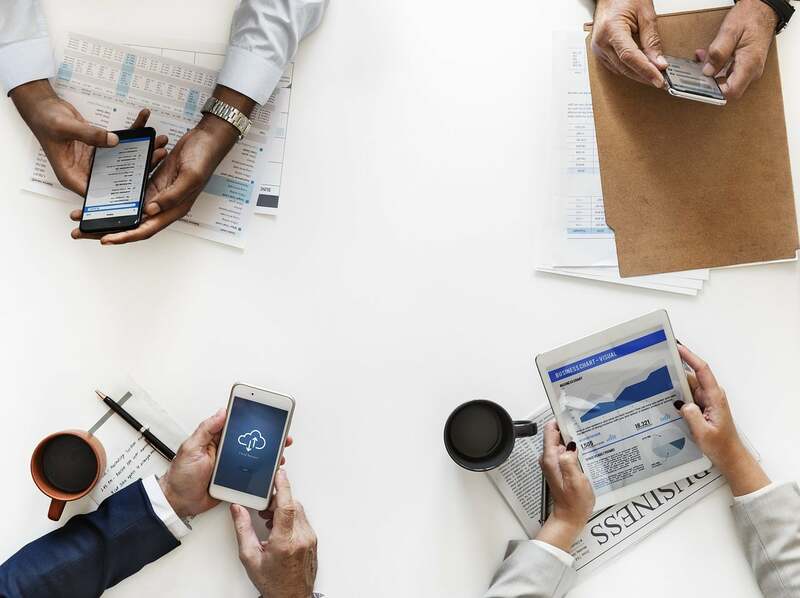 Some legal scholars question whether that approach can be squared with the Constitution and the Supreme Court’s 1998 declaration that the two houses of Congress must approve “precisely the same text” before a bill can become a law. 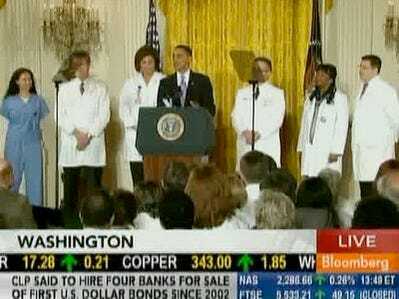 With Polls Overwhelmingly Against Them, Democrats Invoke "Louise Slaughter Rule"
For his latest healthcare announcement, Barack Obama is posing in front of a row of white-coated doctors. He uses that imagery because people respect doctors, and presume them to be non-partisan. They just want a solution. It helps that they’re dressed in white, because we associate whiteness with angels and other holy beings. But look, doctors have their own biases too. They have self interested viewpoints — like opposition to a greater use of nurses, technicians, and devices who might cut into their profit margins. And beyond that, it’s just not true that doctors will necessarily be founts of wisdom about policy or economics. In many cases, it’s likely they haven’t spent any time thinking about macro issues. Obama wouldn’t announce financial reform in front of a line of approving bankers (or insurance executives). Well he looks just as absurd being surrounded by doctors. Democrats as far as San Francisco are freaked out by the fact that a fellow party member could lose in Massachusetts. Mayor Gavin Newsom told the San Francisco Chronicle: "We better get our act together – and quickly… (voters) are so angry. They don’t feel that we’re paying attention to their needs, in terms of their jobs, and what’s going on at the grassroots, in their neighborhoods." It’s actually not all bad for Dems. A Coakley loss is an early wake-up calll, and there are several months before November elections for them to turn things around and get their message right. No doubt the Democrats wish that in 1994, they’d had a similar warning. 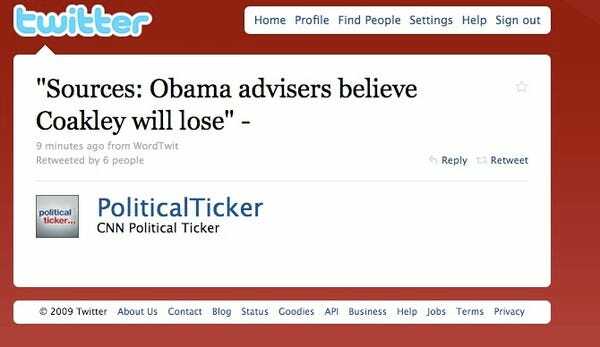 After all, they were largely blindsided by the Republican revolution of that year, predicting with only weeks to go before the election that they’d maintain control of the house. 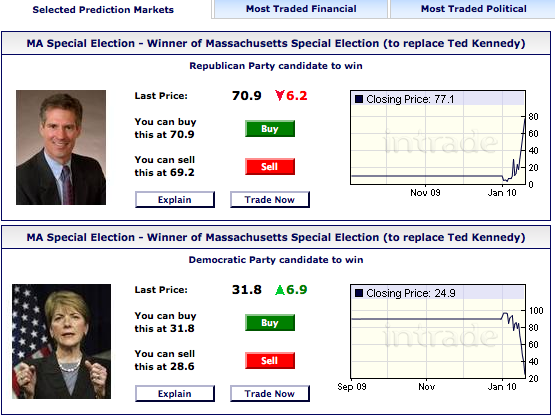 Meanwhile, Martha Coakley is down to 31% on InTrade, which is around the odds that Nate Silver called for. On Mad Money Friday, Jim Cramer predicted a huge market rally on Wednesday if Martha Coakley loses. JIM CRAMER, MAD MONEY HOST: We know it’s earnings season. You can no more avoid it than you could avoid getting your report card or worse – your parents getting your report card. You saw that today when people sold the market on allegedly weak earnings from Intel and JP Morgan, emphasis on allegedly. The Dow getting hurt bad, down a hundred big ones. S&P giving back more than a percent. But that doesn’t mean that the most important factor in next week’s game plan is an earnings report. Far from it. Come with me. The number you need to watch is the number that Scott Brown racks up against Martha Coakley in this amazing Massachusetts Senate race. I say amazing ’cause this was supposed to be a walkover. I mean, even a few weeks ago it was a lock for Democrat Coakley. But now everything’s up in the air, and a Brown win would be devastating for the president’s agenda. Let’s put Brown, okay, and I don’t mean UPS which I happen to own for my charitable trust. Particularly on healthcare reform, because Republican Brown has said he will definitely vote against the plan. Brown in the Senate? That wrecks the 60-vote supermajority the Democrats have been counting on. It could spell the end for this almost year-long nightmare of a piece of healthcare legislation. What does a Brown election mean larger than this? Well, first you’re going to get a knee-jerk rally in all the so-called penalized stocks — the HMOs, the drugs, the medical device-makers. I call it "knee-jerk," though, because these stocks have been on fire for months. Look at Cramer fave WellPoint, or United Health. 52 week high. 52 week high. Merck, 52 week high. It’s been clear as a bell that the healthcare reform wasn’t going to affect most healthcare stocks. That’s versus what we thought last year. p.s. Ilene on twitter here. CNN’s political ticker reports that Obama’s advisers believe that Coakley will lose.